While we were without a kitchen though, it was lots of paper plates, pizza and eating out. We did still try to cook some meals though and having a slow cooker was a life saver. It could sit out all day while we were working and be ready for us later that night. Towards the beginning of our remodel I received a copy of Not Your Mother's Slow Cooker Family Favorites and it was so much fun finding new recipes and new ways to use the slow cooker. 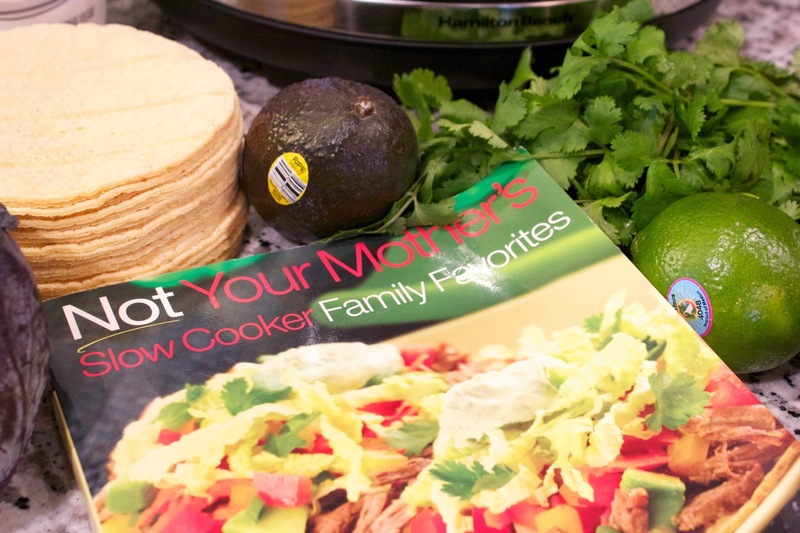 It's filled with variation on all of the classic slow cooker dishes. 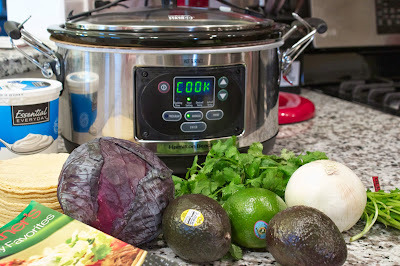 There are tons of soups, stews, breakfast and dinner dishes and a whole section on slow cooking 101 for those new to these amazing appliances. 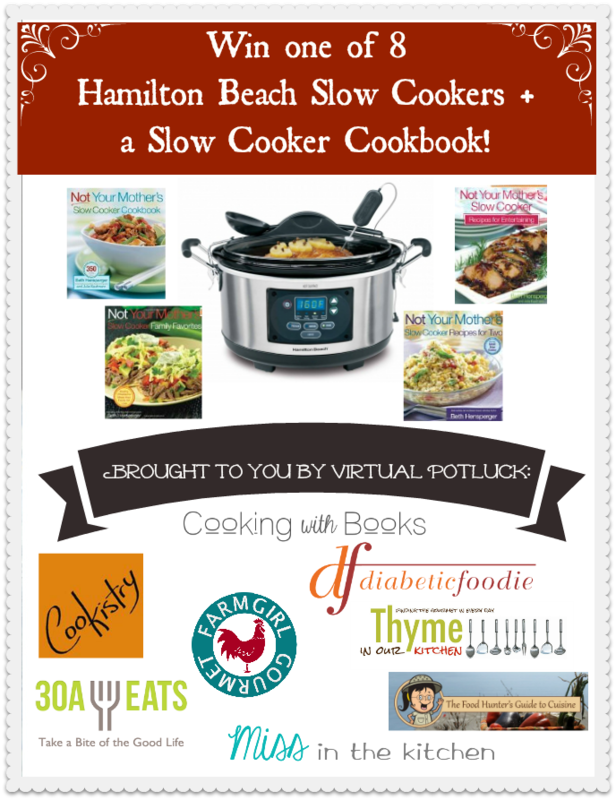 I also received a Hamilton Beach programmable slow cooker and it has been so amazing to use. So far beyond the simple low and high heat, this slow cooker can be programmable with cook times and even has a temperature probe for cooking large cuts of meat! The Virtual Potluck group is giving away 8 of these slow cookers as well as your own copy of the Not Your Mothers Slow Cooker cookbook! Check it out after the recipe. One of my favorite dishes from it so far was the Flank Steak Tostadas. I've never tried cooking a flank steak other than on the grill so I was interested to see how it turned out. After 9 hours on low, it was perfectly tender and pulled apart easily with your fingers. We still had fresh tomatoes, peppers, onions and carrots from our garden and combined with cabbage and avocado made a perfect dinner. The recipe has you bake the corn tortillas until they're crisp but I did some softer baked as well and then used them more as a taco. The cilantro sauce is amazing and definitely perfects the tostada. There was plenty extra and I can't wait to find some more uses for it. Place the flank steak, salt, onion and garlic in the slow cooker. Add water just to cover. Cover and cook on LOW for 8 to 9 hours. Remove the meat from the crock and place in a shallow bowl. Let stand at room temperature to cool to warm, then shred it using your fingers or a fork. Prepare the cilantro yogurt sauce. In a food processor or blender, combine the yogurt, lime juice, garlic, salt, and chopped cilantro; pulse until just combined. Transfer to a serving bowl; refrigerate until chilled. Preheat the oven to 450 degrees. Coat a large baking sheet with non stick cooking spray. 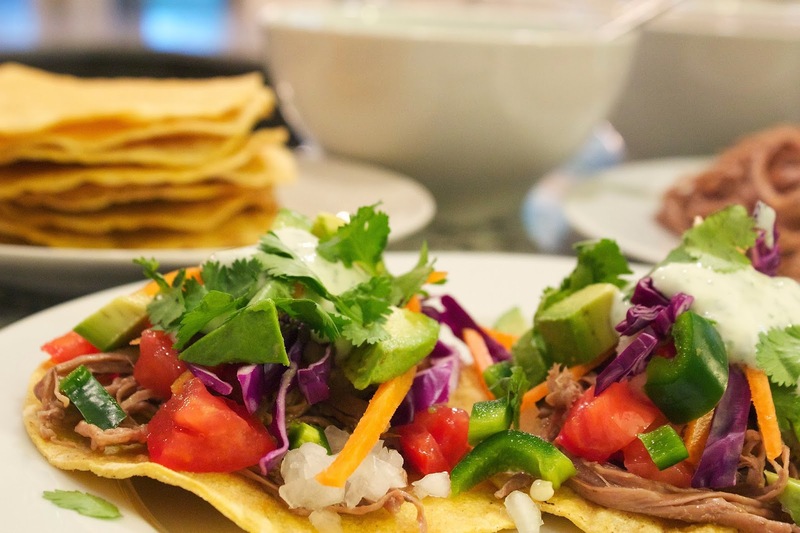 Place the tortillas in a single layer on the sheet and bake until they are crisp and the edges have browned, 5-7 minutes. 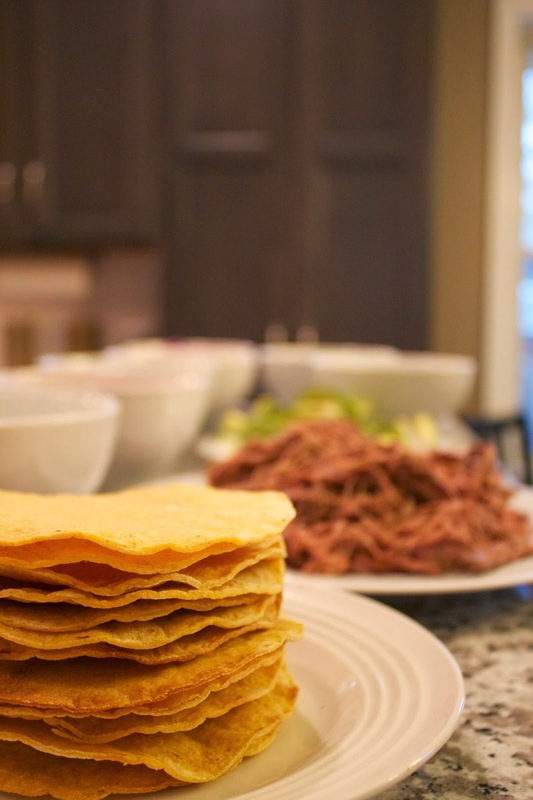 To build the tostadas, place 2 warm tortillas on each plate. 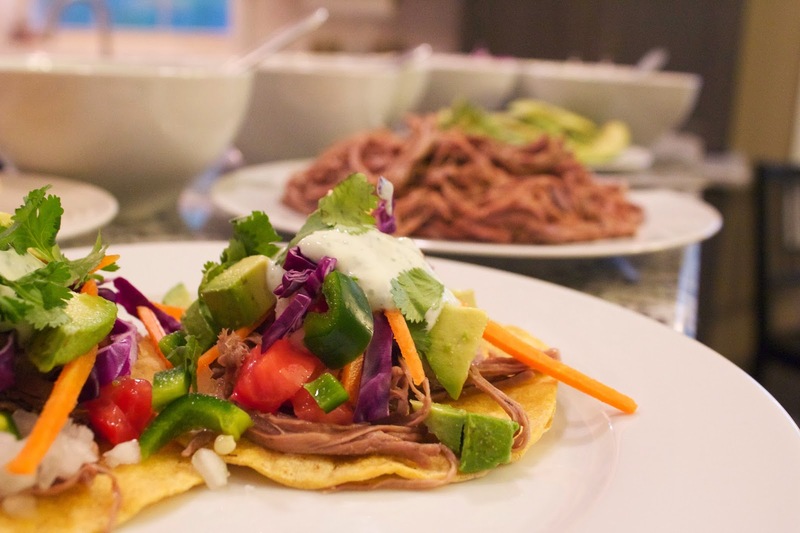 Layer each tortilla with some shredded meat, tomatoes, carrots, avocado, onion and bell pepper. Top each tostada with cabbage, then a dollop of the yogurt sauce. Garnish with the whole cilantro leaves and serve immediately. I love making all different meats in my slow cooker - pork, chicken, beef. My favorite thing to do with it is to shred the meat for tacos, burritos, enchiladas, etc. I made a Greek vegetable dish last week in my slow cooker and it always reminds me to use it more. Nice job Matt! Look forward to seeing you remodel photos and to trying this recipe! I've been checking your blog just waiting for the latest post! So glad it's here and that remodel photos are coming. I've never been very successful at crockpot cooking, everything always tastes over cooked...like it's just boiled for 8 hours. Maybe I need that crockpot 101 section! Well, I did make a pot roast the other day pretty hard to screw that one up. Thanks for the great recipes! Gorgeous colors in this dish! Congrats on finishing the remodel. Your photos are stunning! I could eat this kind of food every day, it is my favorite! These tostadas look so good, congrats on the remodel!